Maggot is the common name of the soft-bodied, legless, worm-like larva of insects of the order Diptera, typically with a reduced head, which may be retracted into the body. The term often is associated with larvae that live on decaying flesh or tissue debris of animals and plants, although there are some species that consume healthy animal tissue and many forms that consume living plant matter. Many maggots have a reputation as plant pests, such as the apple maggot (Rhagoletis pomonella), the cabbage maggot (Delia radicum), the larvae form of the common crane fly (Tipula sp. ), and other root maggots, midge maggots, and leaf miners. Some also are parasites of mammals, eating live flesh or burrowing under the skin to cause lesions or damage to organs. Humans and domestic animals can be infected and thus measures to prevent infestation are often recommended, such as proper garbage disposal. However, maggots also provide many important functions in the ecosystem and for humans. Ecologically, they are important for the decomposition of dead tissues and in retaining nutrients, are vital to food chains, and some, such as the hover fly (Syrphus ribesii) consumes plant pests, such as aphids. Some maggots have commercial use, being sold as bait for fishing or food for pets. Some even have application in forensic science for determining time of death. Furthermore, certain species, particularly blowflies, have important medical applications, being used historically and currently for stimulating proper healing of wounds. A true fly is any species of insect of the order Diptera. True flies undergo a complete metamorphosis, or complex metamorphosis, in which there are four distinct stages: Egg, larva, pupa, and adult. The larval phase of development is commonly known as a maggot. Depending on the species, there are generally 3 to 8 larval stages. Many species have larva in which the head is reduced and retracted into the body, with the much reduced head and mouthparts at the pointed end (Kendall 2007). In the larval stage, the legless maggot generally begins to feed on whatever the egg was laid on, such as decomposing flesh. The maggot gorges itself with food until it is ready to enter the pupal stage, at which point the maggot travels away from the food source to an appropriate, generally moist spot. During the pupal stage, it metamorphosizes into an adult. Maggots tend to be voracious feeders. Ecological functions. Maggots are important as decomposers, helping to break down decaying tissues and retaining the nutrients, rather than being lost. The flesh of dead animals are quickly reduced by maggots. Furthermore, maggots are important in food chains, being consumed by a wide variety of invertebrates and vertebrates. The hover fly (Syrphus ribesii), which is an important pollinator in the adult stage, also has a helpful larval stage, as the maggots are active predators of aphids and other plant-sucking insects and thus are natural enemies of plant pests (Kendall 2007). Commercial functions. 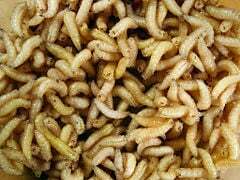 Maggots are bred commercially, as a popular bait in fishing, and a food for carnivorous pets such as reptiles or birds. Maggots have been used in food production, particularly cheese. Forensic science. Some types of maggots found on corpses can be of great use to forensic scientists. By their stage of development (instar), these maggots can be used to give an indication of the time elapsed since death, as well as the place the organism died. Certain live maggots have been employed since antiquity as an economical, safe and effective type of wound debridement (cleaning). Long ago, including during the U.S. Civil War and World War I, some doctors noticed soldiers that had maggots on their wounds healed quicker than those without maggots. Maggot Therapy (also known as Maggot Debridement Therapy (MDT), larval therapy, larva therapy, or larvae therapy) is the intentional introduction of live, disinfected maggots or fly larvae into non-healing skin or soft tissue wounds of a human or other animal. This practice was widely used before the discovery of antibiotics, as it serves to clean the dead tissue within a wound in order to promote healing. While maggot therapy declined with the advent of antibiotics and surgical techniques, there has been renewed interest in recent years. Today, in controlled and sterile settings by licensed medical practitioners, maggot therapy introduces live, disinfected maggots into non-healing skin or soft wounds of a human or other animal. The maggots consume the dead tissue and skin, leaving the live tissue alone, while excreting powerful antibiotics to which bacteria have not yet developed tolerance, thus killing the bacteria or inhibiting their growth. As of 2008, maggot therapy was being used in around 1000 medical centers in Europe and over 300 medical centers in the United States (Ngan 2008). Only a few species of fly larvae are suitable for such use in maggot therapy, notably blowflies (Handwerk 2003). Maggots of the blowfly have been used to treat injuries like pressure ulcers (bed sores), stab wounds, leg and foot ulcers, and post-surgical wounds that are not healing properly (Willis 2001). Diverse maggots cause damage in agricultural crop production, including root maggots in rapeseed and midge maggots in wheat. Some maggots are leaf miners. The apple maggot (Rhagoletis pomonella), also known as railroad worm, is a pest of several fruits, mainly apples. The cabbage maggot (Delia radicum), also known as the root maggot, is a known pest to crops as well. 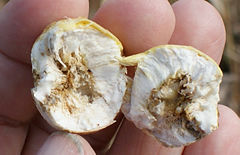 The white eggs, which are about one millimeter in diameter, hatch into while maggots after about six days and the larvae feed for about three weeks on the roots and stems of the cabbage plants. The common crane fly (Tipula sp.) has larvae known as "leatherjackets" that can be a serious threat to farm and garden crops, as well as grassland and lawns, as the maggots live in the soil and feed on plant roots (Kendall 2007). While maggots of most fly species only eat necrotic tissue in living animals and are thus arguably symbiotic, certain types of maggots are parasitic, such as botfly larvae, which spend part of their life cycle as parasites under the skin of living animals. As with fleas and ticks, parasitic maggots can be a threat to household pets and livestock, especially sheep. Flies reproduce rapidly in the summer months and maggots can come in large numbers, creating a maggot infestation and a high risk of myiasis in sheep and other animals. Myasis is the infection of an animal with maggots. While the myiasis of some species is beneficial in terms of maggot therapy, other species attracted to wounds can be harmful. They may burrow into the skin and cause lesions or move through the body and cause organ damage (Willis 2001). The larva of various species of the screw worm fly are unusual in that they attack live flesh as well as decaying flesh. The screw worm fly, which is an obligatory parasite of mammals, including humans, sometimes is referred to as a "flesh-eater." It lays its eggs on the edges of wounds or in mucous membranes of body openings and the larva burrow downwards into the tissue, causing extensive tissue damage and sometimes death. The United States was able to wipe out most populations of this fly by using sterile males to result in eggs that did not hatch (Willis 2001). Humans are not immune to the feeding habits of maggots and can also contract myiasis. Interaction between humans and maggots usually occurs near garbage cans, dead animals, rotten food, and other breeding grounds for maggots. A major problem also arises when maggots turn into flies and start the life cycle over again. Within a few generations the number of maggots grows exponentially and becomes a serious problem. Professionals can remove maggots or many over-the-counter bug sprays can be used to deter flies and maggots. Keeping trash in a sealed container and using a garbage disposal or freezing rotting leftovers until rubbish collection day helps prevent infestation. Handwerk, B. 2003. Medical maggots treat as they eat. National Geographic October 24, 2003. Retrieved November 7, 2008. Kendall, D. 2007. Order Diptera: True flies. Kendall Bioresearch Services. Retrieved November 7, 2008. Ngan, V. 2008. Maggot debridement therapy. DermNet NZ. Retrieved November 7, 2008. Willis, B. 2001. Maggots. Worsley School. Retrieved November 7, 2008.